Keeping hold of life: participants and Wendy Carroll (right) in the recent martial arts seminar. 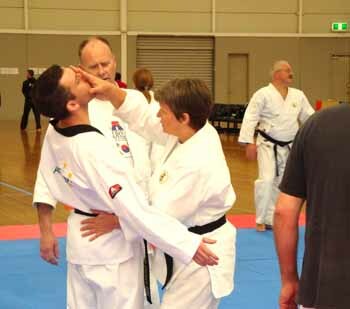 Local jiu jitsu instructor Wendy Carroll played a major role in a seminar held at the Melbourne Sports and Aquatic Centre recently. The seminar, demonstrating 22 different martial arts, including taekwondo, kickboxing, karate and jiu jitsu, raised $12,000 towards the fight against cancer. Kevin Walsh began organising the fundraising event when he learned that his friend Wendy Carroll had discovered that her breast cancer had returned. Wendy, who has more than 30 years experience in the martial arts, has run the Warrandyte Jiu Jitsu Club with her family for almost a decade. She was diagnosed with advanced breast cancer in 2007, but responded well to treatment. However, this year it returned and doctors warned her that she could have as little as a few months to live. But once again she amazed family and friends when it was decided her cancer was now “dormant”. “What my martial arts training has taught me is that when you face a formidable opponent, it’s too difficult to win with one killing blow,” she told the Diary. “So you look for the next best position, and then the next best position until you are in a position to win. “It’s about creating opportunities. That’s how I treat my fight with cancer. At some point it may get me in that position to deliver a killer blow,” Wendy said. Forty instructors donated their time over the seminar weekend, including some who flew in from overseas. Organiser Kevin Walsh has announced plans for another Fight For Life event in 2012. Wendy Carroll can be contacted on 9844 0866.